A scary bedtime story - are you brave enough? 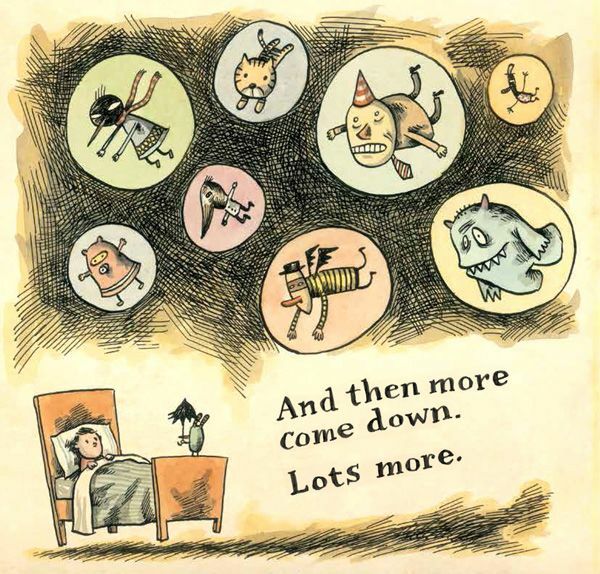 A scary bedtime story – are you brave enough? The dark is a common childhood fear. It’s a nameless, shapeless fear and as such, it can be difficult to articulate and even more tricky to draw – how do you illustrate a fear of the dark? 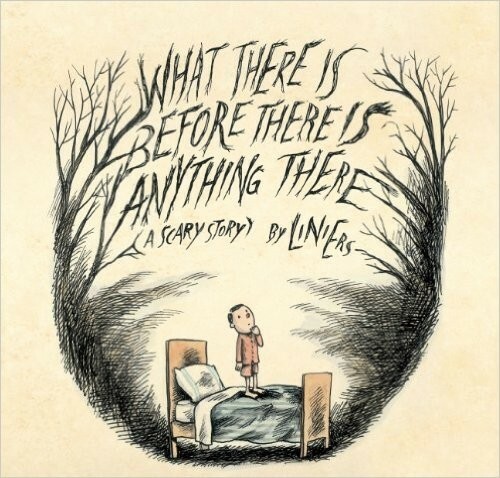 Argentinian cartoonist, Liniers, has done it in his simple but gripping picture book, What There is Before There is Anything There. The same thing happens every night after the little boy’s parents turn off the light. Darkness descends and strange creatures encroach, one after the other. The creatures crowd the little boy’s room and then comes the very worst of them all, the spiky, faceless one that whispers, “I am what’s there before there is anything there . . .”. The little boy bolts to his parents’ bedroom – “Not again?” says his father. “It’s just your imagination,” says his mother, “Sometimes you make things up. It’s good to be able to make things up.” The little boy climbs into his parents’ bed but soon discovers not all of his night-time visitors have disappeared. 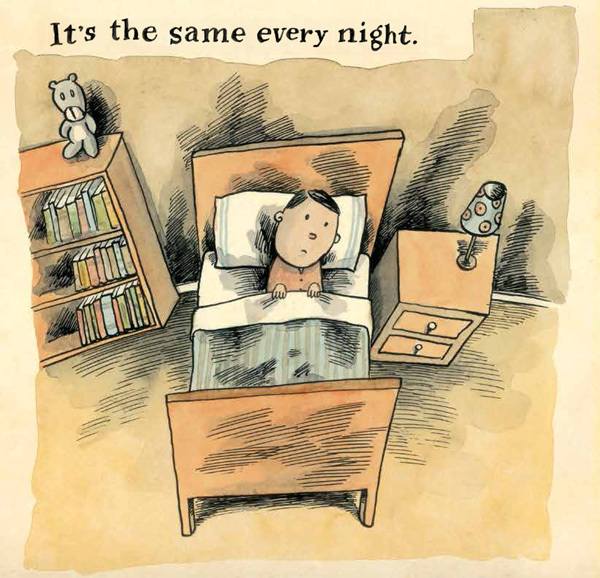 This book achieves things rarely seen in other picture books. It doesn’t dismiss a child’s fear or try to solve it but rather, does the opposite – it acknowledges the fear and gives it shape (and a multitude of faces). There’s dark humour in this story and it certainly won’t appeal to all kids, but for some – the future adrenaline-seekers – there is something wonderfully thrilling and unnerving about this book. 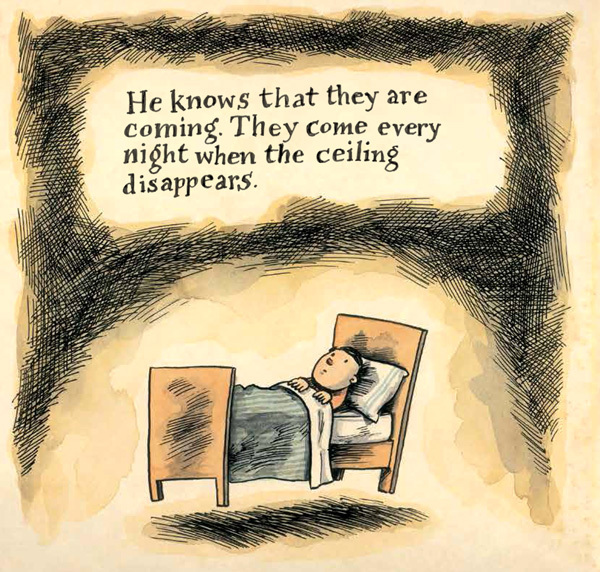 Liniers’ scratchy pen and watercolour illustrations are brilliant, perfectly capturing the apprehension on the little boy’s face; the closing darkness; and the myriad of scary creatures (although for the most part, the creatures are charming and a bit goofy, rather than ghoulish). What There is Before There is Anything There is suitable for children aged six years and over. Find it in all good book stores or online at Book Depository, which delivers free-of-charge to Australia. 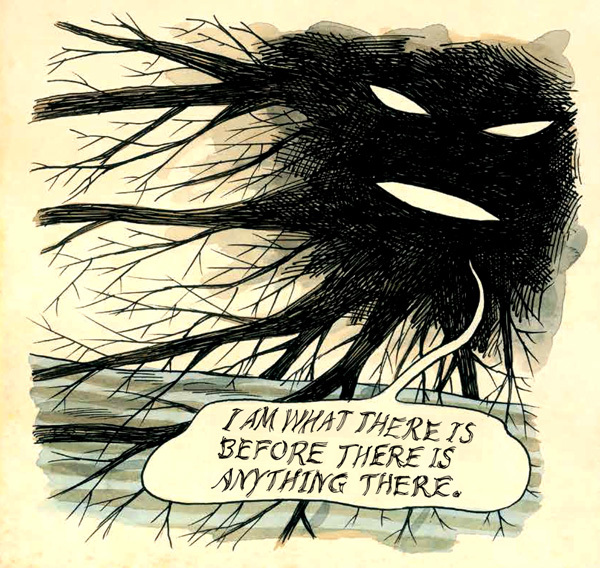 For a slightly different take on a fear of the dark, check out our previous review of Lemony Snicket and Jon Klassen’s, The Dark.